1. Follow steps 1-5 from the first example. 2. 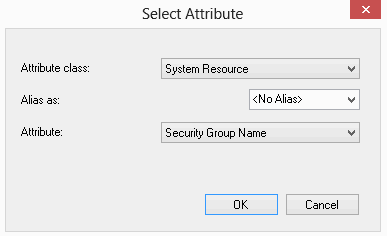 Click on Select, and set the attribute class to System Resource and attritube to Security Group Name. 3. 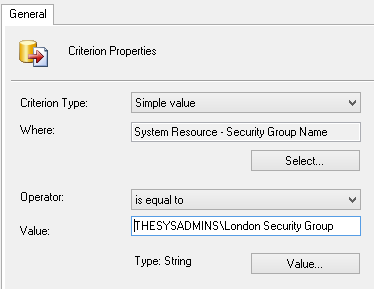 Click on value and choose from one of the populated entries, or manually enter the security group name. 4. Next, Next through the rest of the wizard. 5. 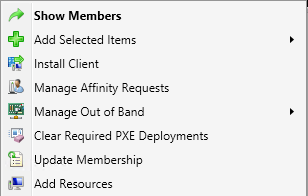 The device collection has now been created. 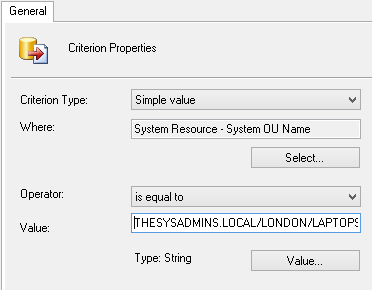 select SMS_R_SYSTEM.ResourceID,SMS_R_SYSTEM.ResourceType,SMS_R_SYSTEM.Name,SMS_R_SYSTEM.SMSUniqueIdentifier,SMS_R_SYSTEM.ResourceDomainORWorkgroup,SMS_R_SYSTEM.Client from SMS_R_System where SMS_R_System.SecurityGroupName = "THESYSADMINS\\London Security Group"
2. 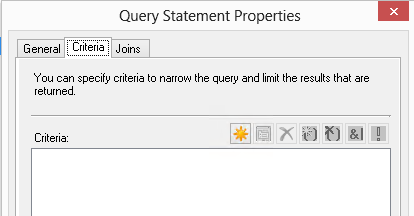 Click on Select, and set the attribute class to Installed Appliactions and attritube to Display Name. 3. 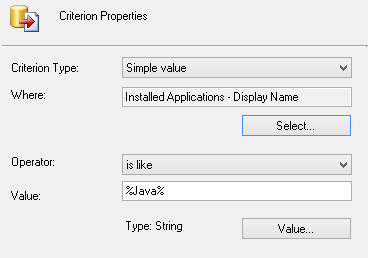 In this example, I’ve set the operator to “is like” and %java%. This will return any device with Java in the title of add/remove programs. 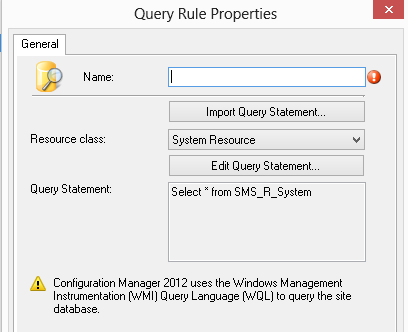 select SMS_R_SYSTEM.ResourceID,SMS_R_SYSTEM.ResourceType,SMS_R_SYSTEM.Name,SMS_R_SYSTEM.SMSUniqueIdentifier,SMS_R_SYSTEM.ResourceDomainORWorkgroup,SMS_R_SYSTEM.Client from SMS_R_System inner join SMS_G_System_ADD_REMOVE_PROGRAMS on SMS_G_System_ADD_REMOVE_PROGRAMS.ResourceID = SMS_R_System.ResourceId where SMS_G_System_ADD_REMOVE_PROGRAMS.DisplayName like "%Java%"
2. 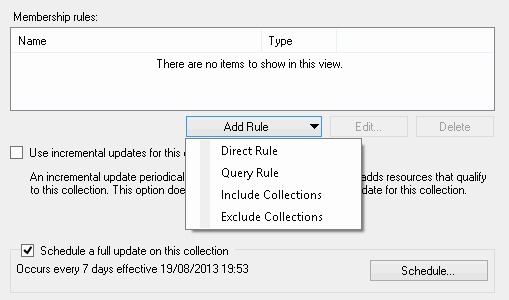 Add a Direct Rule. 3. 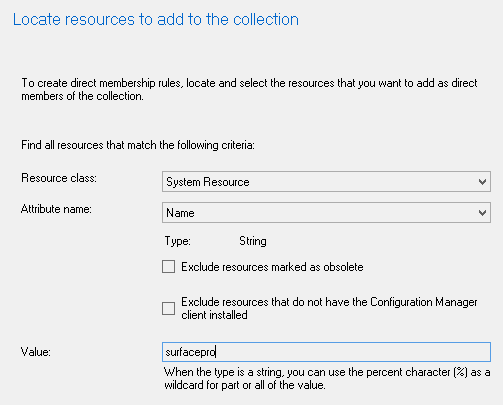 Enter a value of the device you wish to add. 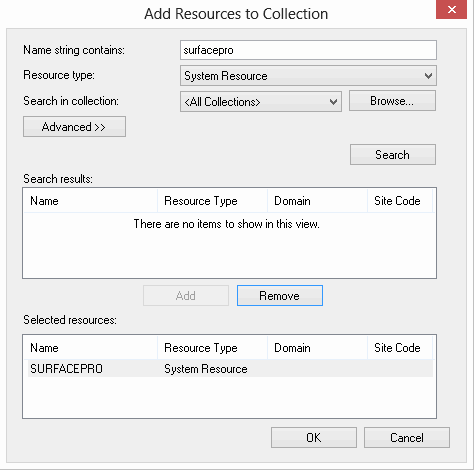 The device must already be in SCCM, you can confirm this by searching for the device under “Devices”. 4. If the device is found you will be able to select it on the next page. 5. Next, Next through the rest of the wizard. 6. The device collection has now been created. 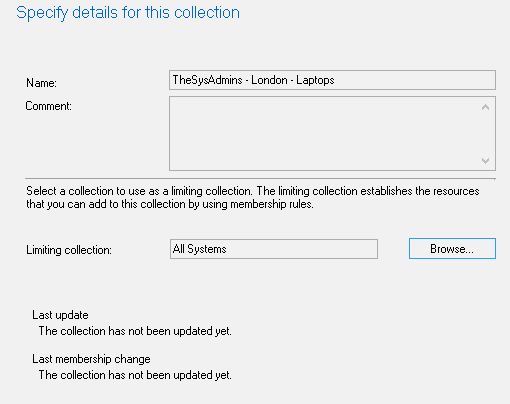 You can also manually add devices by right clicking on the collection and selecting Add Resources. 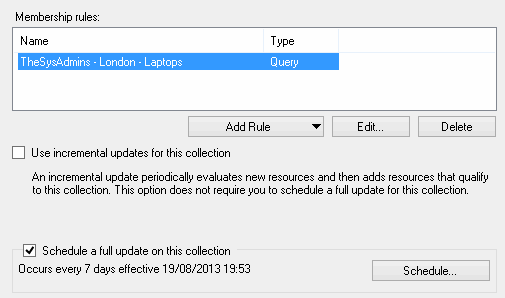 Type in a device name at the top, click search, then select the device in the search results pane and click add and OK.